Frank Grzeszczak at International Yacht Collection tells me of a futher $2.1 million price cut on his central listing, the 58.22m motor yacht Carpe Diem. Delivered by Trinity Yachts in 2011, she features a striking interior designed by Carol Williamson and can accommodate 12 guests in a full beam master suite on the main deck, plus four double staterooms and a convertible gym below. Twin Caterpillar 3516B engines give Carpe Diem speeds of up to 21 knots and she’s ABS classed and MCA compliant. 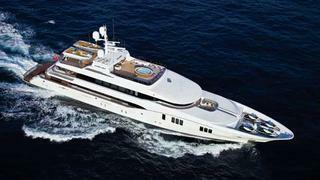 Carpe Diem was a finalist in the 2012 World Superyacht Awards and ShowBoats International Design Awards. Available to view in Miami, Carpe Diem is down from $62 million to $59.9 million.